Continue slowing down until they are driving straight again. 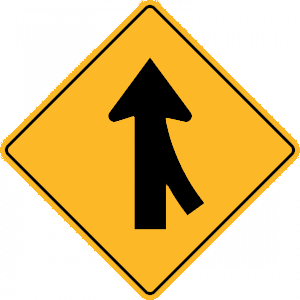 Slow down before reaching the curve and accelerate once passing the middle of the curve. Slow down only if the road conditions are less than ideal. Always slow down before reaching a curve and accelerate only after passing the middle of the curve. If you drive too fast, the tires will not be able to grip the road and your vehicle will skid. No more or less dangerous. Driving at night is more dangerous than driving during the day for several reasons. It is harder to see in the dark, you may be temporarily blinded by the glare from other vehicles' lights, and there are likely to be more drivers on the road who are tired or under the influence. 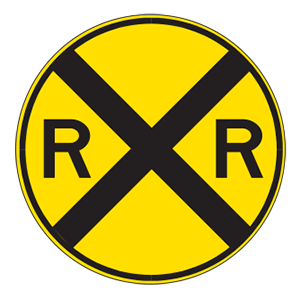 Circular traffic signs indicate upcoming railroad crossings. This sign tells drivers that they are approaching a railroad crossing and should be looking for signs of an oncoming train.